Holiday lights on the water! The Ft. Lauderdale Winterfest Boat Parade! : Atlantic Yacht & Ship, Inc.
Holiday lights on the water, it’s that time of year! Bring on the Christmas lights, Santa appearances and holiday music. Everyone is gearing up for their holiday debut at The Seminole Hard Rock Winterfest Boat Parade. The Winterfest Boat Parade also known as the “Greatest Show on H2O,” will be marking its 46th year this month. The show has become an annual holiday spectacular of holiday lights on the water for Fort Lauderdale. Drawing in more than 1 million live viewers! Every year the boat parade welcomes celebrity appearances, music sensations and local VIP’s. Big and Rich, the country legends singers, will bring you the Grand Marshal experience this year. Are you thinking about entering your boat or yacht into the parade? WSVN Television Producer Dianna Reed, offers decorating tips for your boat. The most important tip that is often overlooked, is to ensure your boat is well lit and visible. Make sure the lights flow around the entire boat. There are viewers set up on both sides of the inter coastal for 12 miles. Additionally, she suggests using props that are tall and light up, giving your boat decorations different dimensions. Here is a fun fact from the boat parade requirements; boats that are 70′ and over must have a minimum of 17,000 miniature Christmas lights! In spite of the saying “less is more.” United Yacht Transport is a local yacht transportation company which transports many of the yachts to this wonderful boat showed each and every year. Now, lets talk safety. The fact that thousands of holiday lights will be placed all over your boat may cause some concerns, as it should! Always ensure lights are placed high enough to avoid the water line at all times. Not to mention, accounting for wakes and waves. Outdoor approved lights and water resistant connectors are important details not to forget. Pay attention to the number of light strands connected together and never use more than the recommended manufacturers limit. 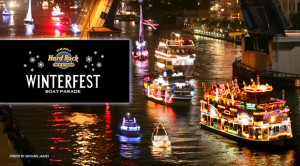 With all this in mind, Atlantic Yacht and Ship, Inc. wishes you a safe and fun Winterfest Boat Parade. For over 56 years, Atlantic Yacht & Ship has been serving the yachting community. Our headquarter sales office is dockside at Harbour Towne Marina. Located in the heart of the yachting capital of the world, Fort Lauderdale, FL. Our in-house waterside service department provides general yacht services. This includes from new teak, to engine rebuilds, captain services, and everything in between. Whether purchasing or marketing a quality vessel, Atlantic Yacht and Ship, Inc. is your one stop resource for the highest quality service and sales in the yachting industry today. If you are looking at yachts for sale, or thinking about selling your yacht, it is always wise to have an experienced broker representing your interests throughout the deal. Contact Atlantic Yacht & Ship at 954.921.1500 or click here.